Bekijk twee van de religieuze schatten van Bulgarije en een andere in Macedonië tijdens deze dagtour vanuit Sofia. Bewonder Sofia's Boyana Church, een door UNESCO beschermde parel beroemd om zijn fresco's uit de 13e eeuw en reis vervolgens naar het landelijke Zemen-klooster, een middeleeuws complex met muurschilderingen en portretten van Bulgaarse edelen. Tenslotte steekt u Macedonië over naar het berghut Osogovo-klooster, dat als een van de mooiste van het land wordt beschouwd. Lunch, Boyana en Zemen toelating, en Sofia pick-up en drop-off inbegrepen. We had a wonderful tour with Maria who was a mine of knowledge and a fantastic tour guide . The trip into Macedonia was lovely and the monastery and surroundings were beautiful - great place to have lunch. Particularly enjoyed Boyana Church since it seemed to have lots of personal touches and we recognised some of the artwork in the archaelogical museum in Varna so were clearly paying attention! Our first trip to Bulgaria and this made a fantastic tour before heading to Varna , Bourgas and Sunny Beach. Bulgaria exceeded my expectations in many ways .Thank you to Maria for a memorable trip and for being a fantastic representative for the Bulgarian people and culture - she really is thorough , professional and lovely person - what more could you want? ps we are watching The Destiny of Fate this evening as recommended so our experience continues! Excellent tour by a safe and knowledgeable guide/driver. Highly recommended! This trip was great! Chimy, my guide, was very informative and accommodating. The monestary in Macedonia is incredible with the views. I highly recommend this! Ci Ci was an amazing guide, Knowledgeable, Accommodating, Insightful and can share her experiences in life as a proud Bulgarian in a modern world. Her experience as a guide helped us achieve time to enjoy all the most important sights on our list. We were more than satisfied with our tour. Thank you to our most excellent guide Maria for a wonderful day exploring Bulgaria and Macedonia - we appreciated all the insightful information and the chance to get to know so much more about the people and country. I'm sure the cats at the monastery in Macedonia will not forget our visit. Aaron, Jay and Dan. This is a really good day-trip if you want to get out of the hustle and bustle of Sofia and have an appreciation for religious treasures. This tour takes you through the Bulgarian and Macedonian countryside, which when I travelled was full of lush, green trees and fields of sunflowers. My guide and driver did their best to ensure I was comfortable throughout the journey, and provided me with insightful information about the monasteries that we visited. The border crossings were painless, and the guide and driver took care of everything - very professional! The light lunch that is included is not exactly light, but very tasty! I had brought snacks for the journey, but these weren't needed. Bringing some water is recommended. One thing I would recommend to anyone on this tour is to bring something for motion sickness, should you be prone to this. The roads aren't horrible, but there is a lot of twists and turns in the road that might make some not feel so great. I enjoyed this one day tour to Macedonia. Our tour guide Chimi provides us all the information on our way to our destination. She has loads of information to share. She gives us interesting stories of the monasteries. It's a private tour just for the two of us and very affordable. Lunch included. I had a fantastic trip. The ride was nice, and I get to see more of Bulgaria. 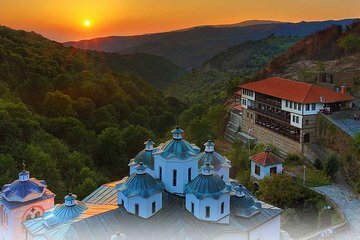 I highly recommended this tour if you don't have enough time and would like to see more of Bulgaria and a little bit of Macedonia. Maria was an exceptional tour guide. She is very knowledgeable and welcoming. She explained to us about the history, politics and economy of Bulgaria as well as Macedonia, in addition to the three monasteries we stopped. They are fascinating, and it makes visiting these important sites much more special. A small group tour means there were only three of us, in addition to the guide that we got to ask as many questions as we want and we did!